I had an early start on the road at 5 am. It was a 6-hour drive to the private game reserve. My excitement levels were off the charts. Not just because I was off on Safari but mostly because of the black square box with the Fujifilm logo on the back seat of my 4x4. The previous night at the launch of the Fujifilm X-H1 in Johannesburg. I had bought the X-H1. I am Fujifilm x-photographer and contrary to popular belief we x-photographers buy our own camera equipment. On arrival at the game reserve, the smell of wet earth from the previous night's rain lingered and filled my senses. It was warm and humid a haze filled the sky blurring the mountains in the background. Safari, a word that conjures up so much in one's imagination. The sights, smell, and sounds of the African bush is something that once experienced you will never forget. The barking of distant zebras and the cackling of nearby guinea fowl woke me from reverie. With a game drive in less than a hours time. I hurriedly readied myself. The black box beckoned me I still had not opened it. It was time to unbox the Fujifilm X-H1. I am not one who suffers from gear acquisition syndrome. But I was really excited to hold the X-H1 again. I had tested the camera in early November although very briefly it was enough time to know that this was the camera that I had been waiting for. A dedicated wildlife camera with awesome video features. Holding the camera again reaffirmed in my mind that it was money well spent. The ergonomics were perfect for photographers like me from a DSLR background. The deep grip and extra bulk felt good in my hand, with my beloved XF100-400mm attached. The balance felt great. I felt energized and inspired. Fujifilm cameras have a habit of having that effect on me. It was time for my game drive, my ranger was ready. Luckily it was a quiet time of the year. I had the 4x4 vehicle and the expertise and attention of the ranger all to myself. I have not been on a guided safari for a few years. Preferring self-drive safaris. I boarded the 4x4 safari vehicle in the middle seat, a rookie mistake that I corrected as soon as I could. Why? 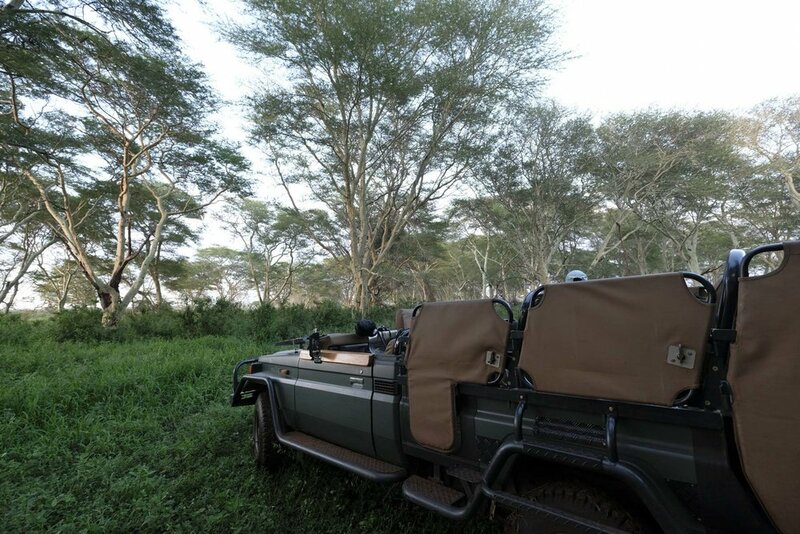 The best seat from a photographic perspective is the passenger seat beside the field ranger. The bench seats behind the ranger, rise in height which in turn gives you a higher angle when photographing. On most photographic tours the "photography instructor" will be seated beside the ranger. This seat has the lowest angle of view, which makes for the best images, and it is easy to rest a big bean bag on the door giving good stability when photographing. The car ride is less bumpy at the front of the vehicle than at the back and less dusty. Just a few pointers for your next photographic safari. On the first day of a safari, my wildlife photography is always a bit rusty. It takes a while to get "my eye" back in vision mode. After a few hours. The X-H1 and I had almost bonded. I missed the exposure compensation dial, not just aesthetically. The replacement button is too small and in a bad location just below the shutter button. I will try and figure another alternative for the exposure compensation, maybe allocate function button if possible. I was enjoying the X-H1. The feather shutter button was a delight to use. Light to touch and responsive. Wonderful! The EVF was bigger and brighter, virtually no lag time when photographing. In fact, to be honest, I cannot recollect any instance of noticing any lag time whilst photographing. Our first encounter with a giant tusker was a sight to be held. I used focus tracking with a single focus point. My lens of choice was the sharp and probably the best zoom Fujifilm has ever produced the XF 50-140mm. I rarely used my XF100-400mm on this safari. As the vehicles are allowed off-road and my ranger could get me really close to subjects. To be honest, I prefer not to get too close to my subjects but rather photograph from a distance and let the subject approach me. This allows me to use the full range of my zoom placing my subject within the environment. I was handholding the Fujifilm X-H1 and the XF 50-140mm as I was still sitting in the middle back bench seat and I had nowhere to rest a bean bag. I know I have 5 stops of stabilization but even so, I always use tripod/beanbag whenever possible. It is a good habit to have, giving yourself the best possible chance of getting a sharp photograph. The Tusker was certainly not shy. In fact, he came right up to the vehicle and rubbed his trunk along the side. Elephants are massive creatures, Tuskers are enormous but this bull was gentle and well mannered. Thankfully. What a wonderful first close encounter. Lions, that was the shout from my enthusiastic ranger. Two big males and two females were walking in front of us down an old track. The ranger suggested going around the lions and getting in front of them to get a head-on photograph of them walking towards us. It was a good idea and told my ranger, who beamed with delight. Millennium rangers are sensitive creatures especially the bearded ones with man buns. They thrive on encouragement. We were all set up and waiting for the lions to come in to view when all of a sudden, a squeal pierced the air. The sounds of lions squabbling led to a sudden realization and collective sigh, a lion kill. We drove as fast as we could and within seconds we could see the lions fighting over the lifeless body of a warthog. By the time we stopped, the big male had taken charge of the carcass keeping it from the other big male. The lionesses realized that there was no way they were going any share of the spoils from the big males and moved off into the deep bush to find another meal. 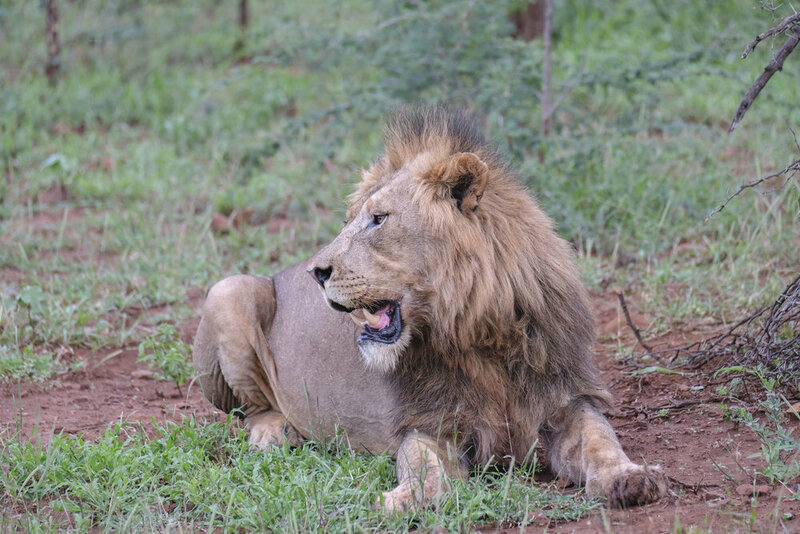 We had missed the kill and the head-on photographs of the lions walking. But that is the life of a wildlife photographer. I am not a fan of using low shutter speeds. But curiosity got the better of me. With the light fast disappearing. I decided to see if Fujifilm stabilization worked. The big male lion posed nicely for me. I was surprised that at 1/60 sec the image was acceptably sharp. I was very pleasantly surprised. Nice to know, if I have to use a low shutter speed that I can photograph with confidence. Just as a side note I activated the IS mode, in "shooting only" for still photography and "continuous" mode for video. By now the Fujifilm X-H1 and I were best friends. I was in love with this bigger version of my X-T2. What of my X-T2? Well, it was with my camera bag with a wide angle lens attached. It was the strangest feeling ever reaching for it as the big tusker approached our vehicle. It felt alien in my hand. I loved my Fujifilm X-T2 and the plan was to use it as a backup. As it is the same sensor as X-H1, I was not going to lose quality, and I was sure that tweaked AF in the X-H1 would come with a future kaisan firmware update. As much as I love my FujiFilm X-T2, we have decided to part ways another Fujifilm X-H1 is on its way. I am after all an ex DSLR shooter and the X-H1 is the camera that I have been longing for, thank you for listening FujiFilm. Over the next two days, we had fleeting glimpses of a leopard, buffalo, rhino during our game drives. Photographically it was difficult as they were generally shy and nearly always hiding behind foliage. Wildlife photography is one of the most difficult genres. It is the most opportunistic regarding the subject, their behaviour and weather conditions. But saying that, there is always something to photograph, it is just a matter of applying yourself to the situation. We hunted high and low for the big five and wild dog. It was not to be, rather than get despondent I looked for other compositions with animals that tend to be ignored. I found three male kudus on a ridge as big clouds rose behind them. A silhouette was the first thing came to mind. By the end of my short Safari, the X-H1 and I were best friends. I was in love with this bigger version of my X-T2. What about my X-T2? Well, it was in my camera bag with a wide-angle lens attached. It was the strangest feeling ever, reaching for the camera as a big tusker approached our vehicle. It felt alien in my hand. I loved my Fujifilm X-T2 and the plan was to use it as a backup. As it has the same sensor as the X-H1 the files would be of similar quality. The X-T2 autofocus may not have been as good as the X-H1. But it was still very good. As much as I love my Fujifilm X-T2, we have decided to part ways. Another Fujifilm X-H1 is on its way. f you are on the fence regarding purchasing the Fujifilm X-H1. Let me give you reasons you may want to consider. If you photograph wildlife and action, it is an easy decision. The X-H1 is the perfect camera for those genres with the added bonus of having excellent video capabilities. I captured a lot of video on safari. l loved the results and it is something that I will focus more on in the near future. The slightly bigger body, tougher construction materials means this camera will take a lot of abuse. The shutter button alone is worth the upgrade it will be interesting to see if future Fujifilm cameras will have this new feature. The autofocus is better than X-T2, especially in the custom modes. The focus was quicker and more accurate. The detail seems better, but this could be my overactive imagination. The X-T2 and the X-H1 both use the same sensor but the X-H1 as we know has a dual processor whether this translates to better detail is open to debate. I am certain those who are more qualified than me will run tests and we will find out in the near future. The EVF on the X-H1 is better, bigger, brighter and virtually no lag time compared to the X-T2. From an action perspective, this is a game changer, no more losing your subject as you use your drive mode. I cannot emphasize enough how the feel and the balance of the camera with the grip attached, especially when you are photographing with the longer lenses. It really makes for a more comfortable photographing experience. In conclusion, Fujifilm is definitely moving in the right direction. The Fujifilm X-H1 is the perfect camera for my photographic needs. But by no means is it the perfect camera. I would like to see improvements to the next successor of the Fujifilm X-H1, longer battery life, and a bigger buffer are a must. Better placement and size of the back autofocus button, exposure compensation button, and the Q button. I am hoping Fujifilm will move to a different sensor as I believe they have taken this sensor as far as they can. I am irritated with Adobe for not solving the issues of Fujifilm raw conversion. I use Iridient X-transformer as a plugin in LR as a short-term fix. As of writing this article, Iridient X-transformer had not released the update for X-H1. The majority of the images used in this article are straight of the camera jpegs (SOOC). The black and white photos were converted in Lightroom and edited in Silver Efex. As good as Fujifilm jpegs maybe. I nearly always prefer to convert and edit RAWS. I am happy to be part of the Fujifilm family and have been honoured to be chosen to test their prototypes. I may be a Fujifilm X-photographer, but I am not paid by Fujifilm. In fact, it actually costs me financially to be a Fujifilm X-photographer in South Africa. My opinions and views are honest and truthful. My love and loyalty are to photography first and foremost.